In 2019 the Coastal Conservation Association celebrates 30 years of advocating for conservation of our coastal marine resources in North Carolina. For three decades, CCA has been fighting to change state policy that manages our coastal fisheries for maximum commercial harvest in the face of data and science that shows continual decline in our finfish and shellfish stocks. After years of commercial industry dominance on the Marine Fisheries Commission that has assured the continued overharvest by fishermen in total disregard of the declining stocks, the resource appears to have finally reached a breaking point. On January 16, the N.C. Division of Marine Fisheries (DMF) held a public meeting in Washington, N.C., to receive public input on a proposed no-possession harvest limit on recreational and commercial harvest of striped bass on the Tar-Pamlico and Neuse rivers. For years, federal dollars designated to the state for management and restoration of fish having “material value in connection with sport or recreation in the marine and/or fresh waters of the United States” have been invested at approximately $600,000 annually to stock the CSMA to help jumpstart the natural spawn of striped bass. Despite these efforts, genetic studies have shown limited success and indicate that 80-90% of the striped bass in the Tar-Pamlico and Neuse rivers are stocked fish. The DMF has continued to allow a limit directed commercial harvest of striped bass on the Tar-Pamlico and Neuse Rivers despite the science that indicates 80-90% of these fish are stocked fish. That is equivalent to spending a dollar to make a dime in your business. Calls for years from CCA to end this insignificant commercial harvest to allow the stocking efforts a chance to make a difference have been ignored. 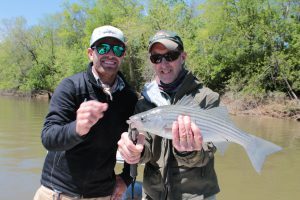 In 2018 anglers were surprised by two good year classes of native striped bass on these rivers and calls for more conservative management intensified. In addition, a published scientific study by the N.C. Wildlife Resources Commission found that the use of gill nets by commercial fishermen on these rivers was contributing to 20% of the mortality of striped bass above and beyond the reported commercial landings. The WRC raised its recreational harvest limits to a 26-inch minimum and two-fish creel limit on inland waters to help take the pressure off the stock. The DMF declined to follow suit and instead has proposed a complete harvest moratorium while refusing to acknowledge the by-catch mortality from commercial gill nets. The DMF has no problem shutting down the recreational harvest while continuing to ignore the destructive impact of gill nets. Many recreational anglers we know would agree to a moratorium if the nets were removed from the water simultaneously to eliminate dead discards. On yet another front, the DMF has released the final report on the current Southern flounder stock status that shows with 100% certainty that the stock is currently overfished and overfishing is continuing. This repeats warnings of overfishing on this important stock going back to at least 2005, yet the N.C. Marine Fisheries Commission has kicked the can down the road in support of continued overharvest to the point that DMF scientists have indicated that a 72% reduction in harvest will be necessary to bring this stock back to a sustainable level in ten years. State statute requires state fisheries managers to implement fisheries management plans for all important state species that will end overfishing within two years and achieve a sustainable harvest within ten years, yet the MFC has voted on every Southern flounder Fisheries Management Plan since 2005 to maintain status quo in the hopes that the DMF scientists are wrong. Now our current MFC is left to make the tough decisions before Southern flounder are lost forever. In 2016 CCA joined with a large coalition that included the N.C. Chamber, the N.C. Wildlife Federation, the American Sportfishing Association, and the Congressional Sportsmen’s Foundation to propose revision of the 1997 Fisheries Reform Act (FRA 97) with House Bill 867 that would have included mandated conservation levels for all state managed fisheries and statutory consequences for not meeting the two-year requirement for ending overfishing and the ten-year requirement for achieving sustainable fisheries. Commercial interests fought any reform of the 20-year-old FRA 1997, again in favor of the status quo. So, status quo again won the day at the General Assembly and here we are on the precipice of no-return for yet another fishery. To their credit, my observations of the Southern flounder FMP Advisory Committee meetings have been very complimentary of the presentations by DMF biologists. They have not wavered in their dire assessment of the current Southern flounder stock status and the need for immediate action to begin reversing the decline even as the commercial industry has again challenged the science behind the reports and championed yet another push for status quo. The recreational fishing industry contributes at least $1.6 billion to the state economy every year and could be closer to $4 billion as we begin to understand the new MRIP data that estimates recreational fishing effort. Current harvest limits for coastal recreational anglers include two striped bass per day with an 18″ minimum length, October – April in the CSMA; one grey trout per day, 12″ minimum; four speckled trout per day, 14″ minimum; one red drum within a 18″-27″ slot limit; and four flounder per day, 15″ minimum. River herring, once an eastern North Carolina fishing tradition for many families, has been closed to all harvest since 2005. Spot and croaker fishing is now a distant memory. So, with the proposed moratorium on harvest of CSMA striped bass and a 72% harvest reduction on Southern flounder, what can a recreational fisherman expect to take home when fishing on the Pamlico and Neuse rivers—one red drum, four speckled trout and one grey trout? You can expect that Southern flounder creel limits will be cut dramatically and the season severely limited, but will fisheries managers finally address the elephant in the water—gill nets? Gov. Cooper and the N.C. General Assembly should be embarrassed by the state of our coastal fisheries if they bothered to pay attention to our current marine issues. Gov. Cooper came into office with a Marine Resources Policy Paper that included his following position: “As someone whose father instilled in him a deep appreciation for the lands and waters of North Carolina, and the wildlife that lives in them, Roy Cooper understands the significance of these natural resources and the necessity for their responsible management. Unfortunately, today our once abundant marine fisheries resources are no longer. The fish, shrimp, oysters, and crabs in our sounds and estuaries that once defined our state are now declining or depleted. The General Assembly has long deferred to the coastal caucus on fisheries management legislation, ignoring the interest of the rest of the citizens of North Carolina that own these public trust resources. In recent years there has been a growing attention among a minority of legislators that support sportsmen and conservation of our state’s natural resources. The decisions of the MFC on CSMA striped bass and Southern flounder are the canaries in the coal mine for the future of our coastal fisheries. Hopefully, the legislature and the governor are finally paying attention to the results. Let’s hope that the CSMA striped bass and Southern flounder situations force us all to wake up to the need for a new energy and intelligence with which we manage our coastal resources before it is too late. We need strong conservation leadership from our Marine Fisheries Commission, the governor and the legislature now.